A novel type of journal that has been recently developed is one which ‘piggybacks’ off pre-print servers, known as an ‘overlay journal’ as peer review is viewed as an additional layer to a publication. In fields like maths, astrophysics or cosmology, the research community already publishes for free on the arXiv. 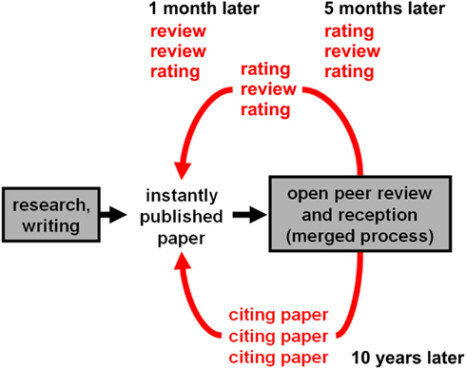 New journals such as The Open Journal or Discrete Analysis are exclusively peer review platforms that circumvent traditional publishing by utilising the pre-existing infrastructure and content of the arXiv to perform peer review easily, rapidly and cheaply subsequent to the publication of articles. A relatively new mode of named pre-publication review is that of pre-arranged and invited review, which at ScienceOpen we call ‘Peer review by endorsement’ (PRE). This has also been implemented at RIO, a new open journal, and requires that an author solicits reviews from their peers to assess the suitability of a manuscript for publication. While some might see this as a potential bias, it is worth bearing in mind that many publishers ask authors who they want to review their papers anyway. Reviewer identities and their endorsements are made publicly available alongside manuscripts, and the idea is to remove pre-submission peer review bias, while removing potentially deleterious editorial criteria from inhibiting the publication of research. Also more positively, PRE is a much cheaper, legitimate and unbiased, and faster and more efficient alternative to the traditional publisher-mediated method. In theory, depending on the state of the manuscript, this means that submissions can be published much more rapidly as relatively little processing is required. At ScienceOpen, we see peer review as part of a public, collaborative process. Criticism of research shouldn’t stop simply because an article has ‘passed’ traditional peer review and become part of the published record – research evaluation naturally wants to a more perpetual progression than that. Articles submitted to ScienceOpen are not pre-selected based on any subjective estimate of their perceived impact – we prefer to let research speak for itself. Between submission and acceptance, manuscripts only have to undergo an integrity and ethics check by our Editorial Office, and are then subjected to post-publication peer review. This means that the entire research community can contribute to the review process through the ScienceOpen network. Quality control is moderated through ORCID, and the only requirement we have for formal peer review is that referees have a minimum of five items assigned to their ORCID account. We believe that this layer of quality control is important in maintaining the authoritative use of research articles beyond the simple publication of a research paper. Post-publication peer review is an alternative the model of peer review by endorsement, discussed in a previous post. But much more radical than how we peer review the papers submitted to our own journal – ScienceOpen offers the same post-publication peer review tools for all of the 11 million articles on the site. Wherever and however your pre-publication peer review was carried out, your paper can still be evaluated on its scientific merits, rated and discussed on the ScienceOpen platform. Want to get credit for sharing your expertise with the scientific community in the form of peer review? Review any of the 11 million articles on ScienceOpen and share your knowledge. What are the current advances in peer review? Should referees get credited for reviews? Should referees sign their reports? Should referee reports be published?